We are SO lucky in some ways. Yes, it’s hot. Yes, it’s humid (well, usually). Yes, traffic stinks. 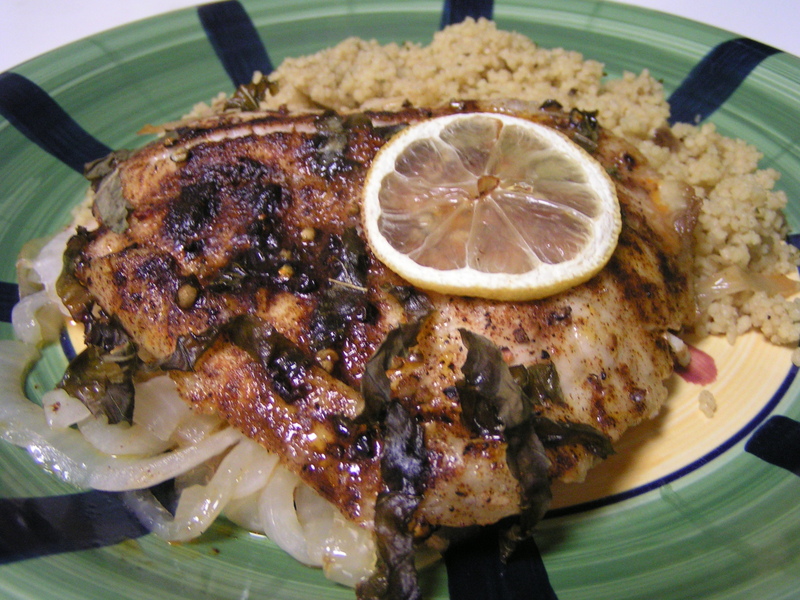 But we do get to have access to some of the best fresh seafood, courtesy of the Gulf of Mexico. I was feeling adventurous yesterday, so I ran over to the fish market about 20 minutes from the house to see what they had in stock. It’s always fun to arrive and see the shrimp trawlers pulled up to the docks out back, and see the guys unloading their haul with shovelfuls of ice. The seagulls I could do without, though Rat Boy has believed they are his minions ever since the fateful beach trip where I gave him a bag of Goldfish crackers and let him feed the flying rats until his little heart was content. 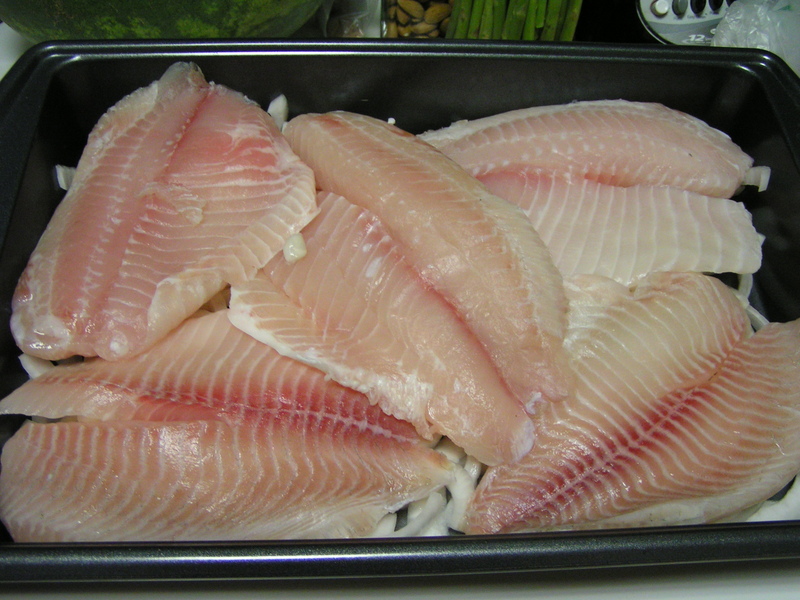 Anyhow, I decided to get some Tilapia, mostly because it looked great, and they had already sold out of Redfish. 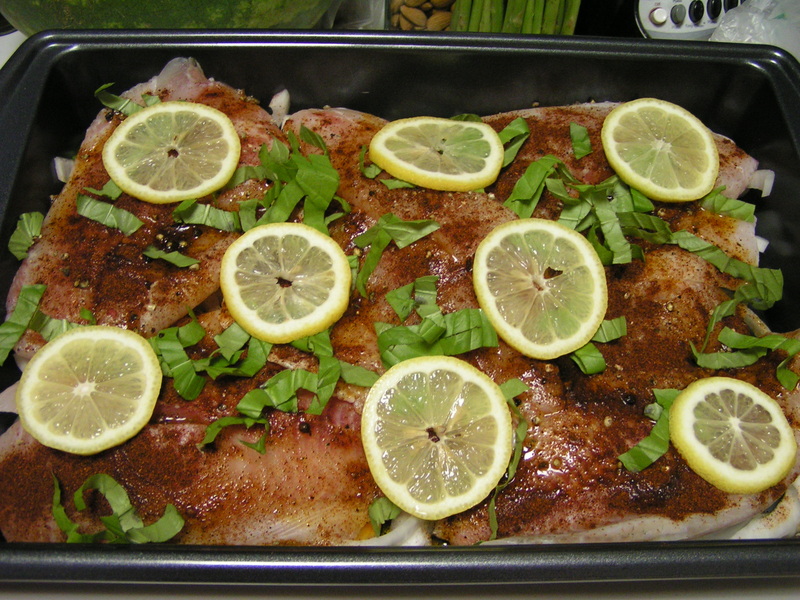 I like to bake Tilapia, as it’s pretty firm, but usually very thin. The filets I got yesterday were a little more robust, but they were a bit larger than usual, so I guess that’s to be expected. 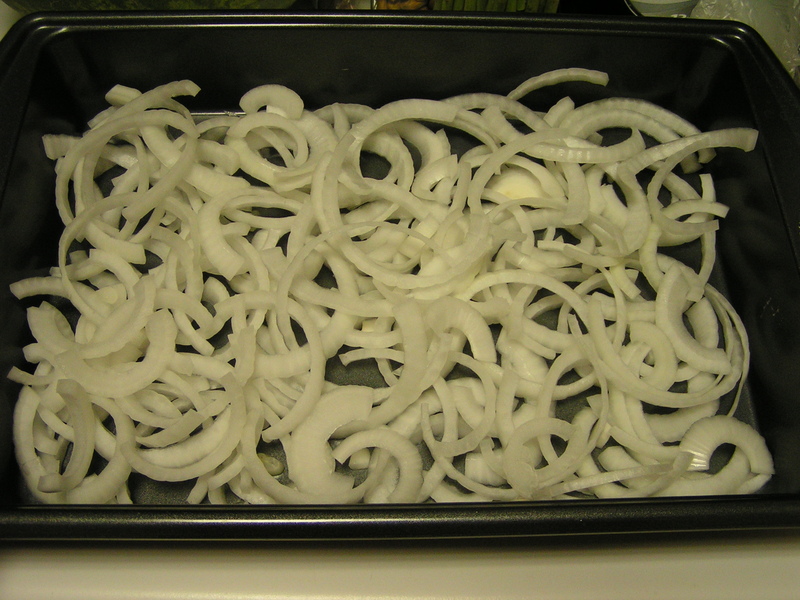 I start by slicing an onion (sweet for this dish) fairly thin, and layering it in the bottom of the pan. The fish lays nicely on top. This keeps it raised up on a little platform of onion, not soggily soaking in all the juices. Plus, the onion tastes fabulous when it’s finished! 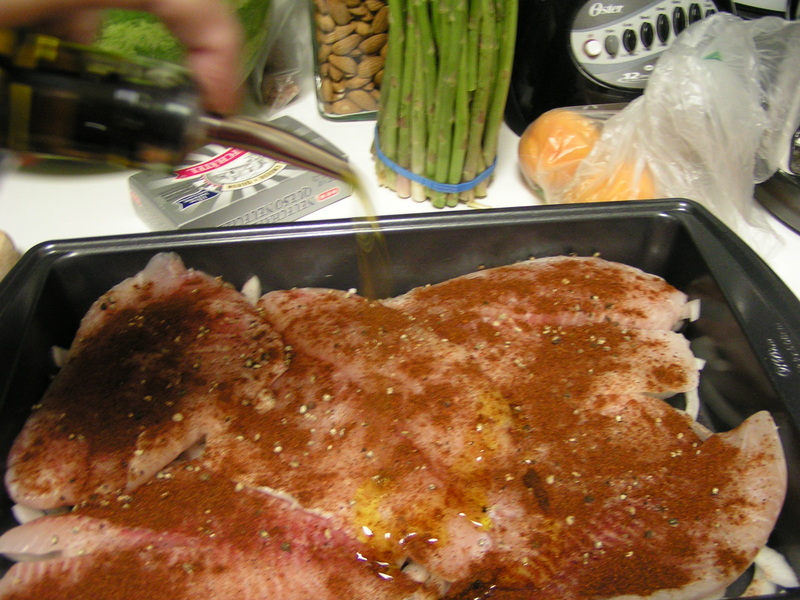 Sprinkle some black pepper and chili powder on the fish, then drizzle olive oil over the filets. This is the thyme infusion I made about a month ago with thyme from the thyme/basil experimental pot on the porch. I added a thinly sliced lemon and some coarsely chopped basil. 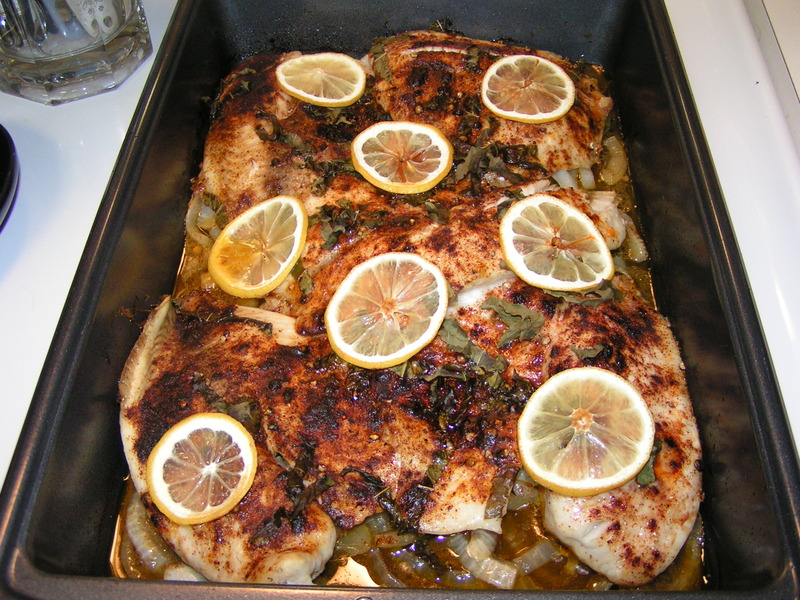 Pop it into a hot oven…400F for about 20-25 minutes. The fish should be flaky when it’s done. It just looks gorgeous when you pull it out of the oven. If you’ve got a nice casserole dish, you can use that, and it goes straight to the table looking awesome! Last night, it was available at my take out counter (aka the kitchen counter) with a mushroom couscous. This is SO easy, and looks so pretty. Everyone thinks it took hours to prepare. Truth is, I only had the oven on for about 30 minutes in all. But we won’t share that. Don’t forget…keep wiping your brow and muttering, as I find that tends to keep the menfolk out of the kitchen. Then enjoy a nice glass of vino! 🙂 And graciously accept their praise when they dig into this yumtastic fish! Previous Orange Chicken Next Caturday is Here Again! Uh, that is T-I-L-A-P-I-A, girl. OMG. Well, you saw how early I was posting. Was going to the mall (again) today with Mum and Rat Boy. Couldn’t get my fingers to work! LOL At least I’m consistent!